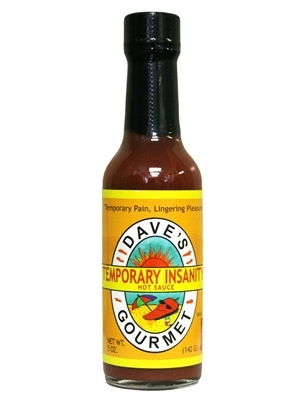 Still a sauce for serious Chileheads, Dave's Gourmet Temporary Insanity Sauce won't curl your toes quite as much as its two hotter brothers. Hot Peppers, Tomato Paste, Hot Pepper Extract, Salt, Cane Vinegar, Onions, Garlic, Xanthan Gum, Citric Acid, Basil. Want hot? It gets the job done. The initial flavor is sweet cayenne mixed with habanero. The after burn is about three minutes on the tongue. Too hot for dipping, but not stupid hot. More versitile than most extreme sauces.